EZ-Stik #3 is a trowelable butyl sealant suitable for pumping or trowel dispensing onto concrete structures. 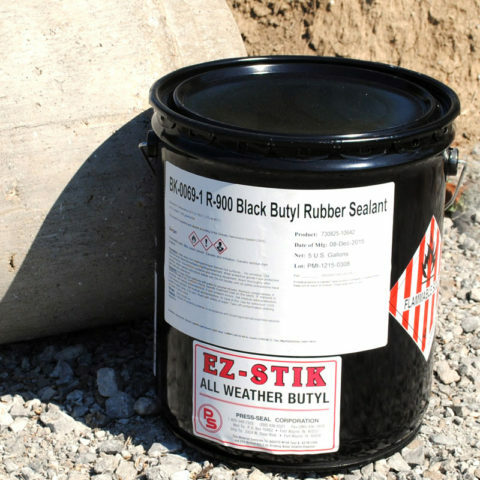 EZ-STIK’s butyl sealant is primarily used as a backplaster on manhole and box culvert joints and as an external manhole chimney seal. It can be used as a primary or secondary flexible seal that bonds to a wide variety of materials. The physical properties of the sealant resists temperature extremes, acids and alkalis. Apply and smooth with a clean edge trowel blade at 1⁄4” minimum thickness. If using in water collection system, do not backfill immediately. Excellent gap and crack filling properties. Resistance to acids and alkalis. TROWELABLE EZ-STIK #3 is available in 5 gallon pails or in cartons of 12 – 11 ounce caulking tubes. Must ship via truck freight due to flammability. The sealant should be applied with a smooth-edge trowel. Then it should be applied a minimum of 1/4” thick. The surface to be protected must be totally covered with no surface showing through the sealant. Coverage is 7 square feet per gallon when applied 1/4” thick. When using this sealant as an external chimney seal (Butyl Rubber Backplaster), apply it 6” from below the top cone to the casting. Then it should be applied 1/4” thick with a smooth-edge trowel. After coating the chimney, with the sealant, wrap the applied #3 EZ-STIK with a 6mm polyethylene plastic sheeting by Visqueen or approved equal. Wait 20 minutes before back-filling. The structure should not be back-filled for a minimum of 20 minutes after coating with the sealant. This allows the solvents to dispense throughout the #3 EZ-STIK.